England has some of the most expensive public transport in the world, but for four Mondays in October fares across London are free to anyone using a Mastercard through Android Pay. 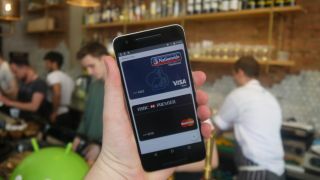 Simply load your Mastercard into Android Pay, then use your phone on the contactless terminals for London buses, tube, tram, DLR, TfL rail, Overground, Emirates Air Line cable car, MBNA Thames Clippers river bus services and most National Rail services in the city and Mastercard will refund the fare, up to £30.50 per day. The offer is available on October 3, 10, 17 and 24, but if you're not in London you don't have to miss out, as you can also get a free hot drink at Caffè Nero stores nationwide on those same days by using a Mastercard with Android Pay. The incentive is an obvious way to get more people using Android Pay, and it's well timed, as four more UK banks recently signed up to the contactless payment service.